I hate reviewing old cult films. It's not that I don't have an opinion or said opinion is divisive or controversial and will unleash the proverbial internet army of darkness on me. It's just hard to really offer anything vaguely original or garner much interest in a review of a film everyone and their dog made their mind up about a long time ago. It's also hard because I too have old opinions and fond memories though it must have been twenty years since I watched it and there's always the inherent dangers of returning to something after so long. Talking of a long time ago, (apologies for the awful segue), Army of Darkness marks quite the change in direction from the quite similar in style and story prequels. Right from the start, as wise cracking Ash Williams (Bruce Campbell) crash lands along with his 1973 Oldsmobile Delta 88 (thanks wiki) in 1300AD medieval Europe and is seized by Lord Arthur (Marcus Gilbert) and his band of sword wielding superstitious knights it's clear that Evil Dead part three is to be more fantasy and high jinx than the claustrophobia and brooding of its namesake. The Evil Dead 1 and 2 are farces of a sort but they're still, in my mind anyway, unquestionable horror flicks full of provocative vision, disturbing ideas and gratuitous bad taste. They're comedies but dark, quite nasty and definitely for adults. Army of Darkness for all the imagination and dark undertones never quite achieves the same level of nastiness or malice and I'd almost use the word tempered. Yes there's still possession, bloodshed, dismemberments and yes Ash still wields his chainsaw hand with manic desperation but it's all rather fantasy horror comedy and The Goonies, than unrepentant and unapologetically dark and The Exorcist. This isn't to say this is a bad thing and does allow Raimi off the leash and able to explore is undoubted talent in a more expansive and extravagant sandbox; it's just the shift in tone half way realised in Evil Dead II is more acute. Bruce Campbell stole the show in The Evil Dead and quite rightly was thrust front and centre for Evil Dead II. For Army of Darkness he's again, given full permission to leap and bound about with all the goofiness and slapstick that makes his performance so endearing. Yet, such is the overt grandeur and now seeming invulnerability of his character it maybe loses some of the impact it had in his previous outings when the lines and behaviour was more in reaction to the events that were unfolding. 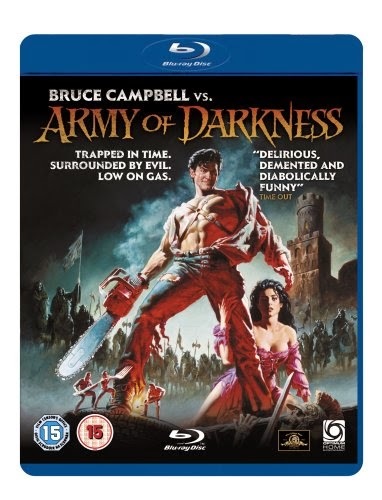 This is Bruce Campbell vs. Army of Darkness, not Bruce Campbell getting beat up and driven insane by the Army of Darkness. Ash's confidence was born from being placed in the centre of the an inescapable maelstrom of horror and death, and somehow finding the strength and inner-madness to fight back. Suddenly thrown into the eternal conflict that is the living and the dead some 700 years in the past, he doesn't show any of his previous insecurity coming across perfectly at ease as the one man slaughterhouse and complete hero / anti-hero. Arrogant, uber-confident with the perfect one liner for every occasion he slaughters all who oppose him with ease and precision. 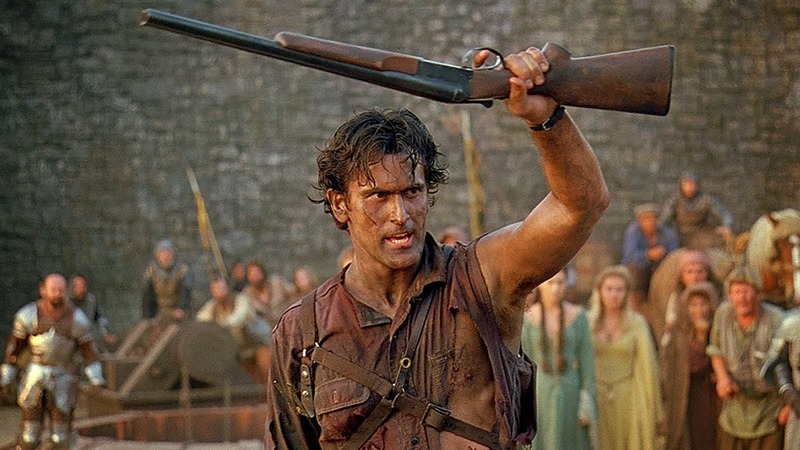 It's not all bad, far from it and Bruce Campbell is a delight to watch it's just I think I prefer it when Ash is on the back foot instead of coming across invulnerable and over-cocky. Zombies. There's much debate whether the Evil Dead films could ever be considered zombie ones and I'm still kind of on the fence. Evil Dead 1 and 2 contain possessed living and dead; taken over by evil spirits unleashed by someone reading from the necronomicon. 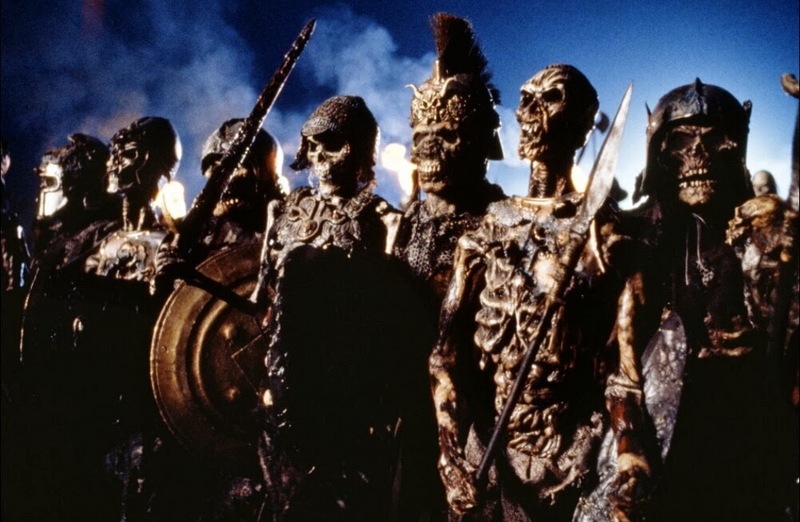 Army of Darkness has possession, reanimated corpses and skeletons that seem to have a will, consciousness and dare I say personality each of their own. They're a bit of a mixed bag of well made and choreographed live actors, and jerky stop motion Jason and the Argonauts animated figures. Such is the playfulness of proceedings it's never overly distracting, even when jarring and obvious, and it's not something we'd want to start worrying about anyway or we'd soon be over run with questions, like exactly how does a bag of bones talk and laugh without lungs. 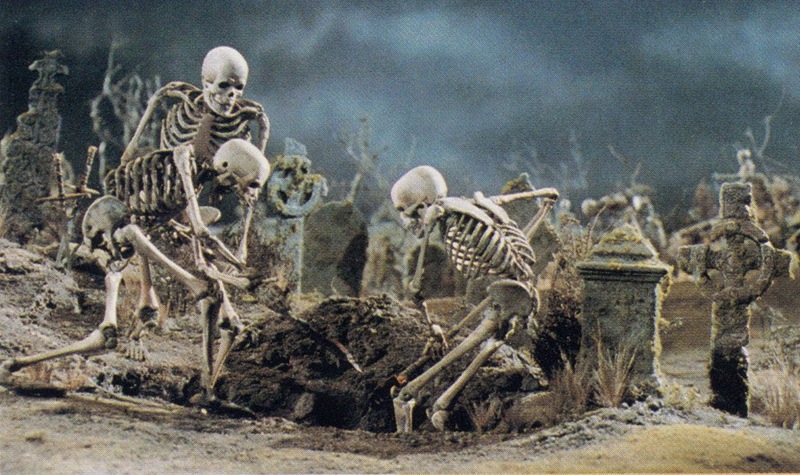 So, it's full of the reanimated bones of the dead, the possessed dead (and alive), and ever some rather ghoulish looking recently exhumed live actors that do indeed look rather zombie but there's no head shots, no viral blood transference or ever any desire to try and take a bite out of someone. It's an army of the dead trying to kill living; why? Because. Also, Raimi et al called them deadites pushing distance between them and Romero and all things Z and I'm not going to argue semantics. Army of Darkness is brilliant Sam Raimi yet again and a joy to watch. Full of imagination, skilful, playful directing and cinematography it flows from scene to scene with grace and confidence. Taken for what it is though, a goofy action adventure with a slightly darker undertone than Spielberg would try, it's an incredibly fun and rewarding ride and always entertaining. Bruce Campbell also quite rightly has his name emblazoned proudly on the cover as this is his show and it is him, not Ash from the prequels, that's up against the undead horde. Brilliant, wacky, proudly b-movie-esque and cheesy, and replete with some of the best (and worst) of one line quipping, I still love it, 8/10. It's hard to write about anything that's been written about as much as Army of Darkness. You did good though! Nice review! I reviewed Evil Dead 2 at one point, but I need to eventually get around to the first film, and DEFINITELY this one. Cheers, I hadn't realised you hadn't reviewed it yet. I've rewarded myself with a pile of 1p obscure DVDs as a reward! Huzzah!